Educated at Harvard-Radcliffe (B.A., Classics) and Princeton University (MA, Ph.D., Art and Archaeology), Laetitia La Follette specializes in the physical culture of the ancient Mediterranean. Initially drawn to this area of the world by her love of languages (French, German, modern Greek, Italian), she discovered monuments spoke to her more powerfully than texts. 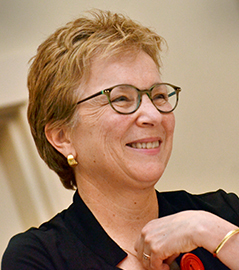 Since her arrival at the University in 1987, Professor La Follette has developed two other passions, the teaching and learning of art history and the protection of cultural heritage. As director of "A History of Art for the 21st Century," she produced, edited and contributed as co-author to this collaborative grant-funded e-text involving departmental and Five College colleagues. The multimedia online modules (funded by the U.S. Dept. of Education's Fund for the Improvement of Post-Secondary Education (FIPSE) and the Davis Foundation) help students in introductory surveys of art history master skills and learn basic concepts. As Vice President for Professional Responsibilities of the Archaeological Institute of America, she has helped coordinate testimony by archaeologists at the Washington, D.C. hearings of the Cultural Property Advisory Committee, U.S. Dept. of State, on new requests for and renewals of Memoranda of Understanding between the U.S. and such countries as Italy, Greece, Peru, Cyprus, Cambodia and China that seek to protect and promote archaeological heritage. Negotiating Culture: Heritage, Ownership, and Intellectual Property. Amherst and Boston: University of Massachusetts Press, 2013. "The Trial of Marion True and Changing Policies for Classical Antiquities in American Museums," Negotiating Culture: Heritage, Ownership, and Intellectual Property (2013), chapter 2. “Parsing Piety: The Sacred Still Life in Roman Relief Sculpture," MAAR (Memoirs of the American Academy in Rome) (2011-2012), 15-35. “Se parer en Vestale: un travail de funambule?” Parures et Artifices dans Les Mondes Antiques, eds.L. Bodiou, F. Gherchanoc, V. Huet and V. Mehl. Paris: l'Harmattan Collection "Histoire, texte et societe," 2011), 155-171.